Minister for Transport Paschal Donohoe has been asked not to use a sign (above in yellow) recognised by international road traffic law unless he puts legal backing behind it. 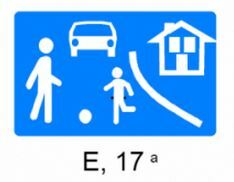 IMAGE: The international sign for residential area with pedestrian priority and legal protection for playing children. The Galway Cycling Campaign said yesterday that using the signs would be confusing given that such signs are used with legal backing in other countries, where some streets are legally defined as “living streets”, “residential areas” or “play streets” — no such legal backing exists or has been announced in Ireland. However, it said that Irish traffic law confines pedestrians to footpaths unless crossing the road. The signs are part of the Department of Transport reaction to the Jake’s Legacy campaign which seeks to have 20km/h as standard in residential areas. However, Jake’s Legacy has said they are unhappy that lower speed limits are being left up to councils which have been slow to act on the issue. The Galway Cycling Campaign said that Ireland is now “effectively rejecting international standards” it is calling on the minister to either drop a recently announced road sign or bring Irish traffic law into line with how the same sign is used in international traffic law. Completely agree. In Ireland, authorities seem to think that just putting up signs will change that part of the road immediately. A clear law is needed and, equally important, the layout of the road needs to be adjusted too. This is not only needed for this particular sign but for instance also for the general 30 km/h zone. In my eyes a two lanes for cars is not compatible with a 30 km/h zone. One lane of traffic will also automatically slow traffic. The hardest thing to change is the people’s mindset that a car has priority in a city centre where it should mainly just be condoned and limited by specific rules and regulations. This is a highly peculiar use of this sign. In many European countries it actually means an end to all previous limitations on that road. @dublinstreams — Had not heard of that, thanks. should have said Balbriggan-Swords and the other areas too over the coming weeks. These have been added all over Dublin city council’s area and are about to be unveiled any day now.